Swing gates are highly effective sort after types of automation where the installation of sliding gates is not feasible for securing your home, industrial & commercial property. Gates range from pedestrian gates through to Entry / Exit gates up to 16 meters opening size. All types of Architectural Materials. Hot Dip Galvanised including Powder Coat. Gate widths upto 8 metres. – 24v Linear, Articulated Arm & Inground operators. – 240v Linear, Articulated Arm & Inground operators. – 3-phase Articulated Arm (only requiring single phase input). Manual release in the event of power failure. All essential safety devices connect to gate operator. Control with purpose-built control board, or optional by a Programmable Logic Control board. Photo Electric Beams (PE Beams). Flashing light to notify gate operation. Battery Back up in the event of power failure. Integration with Access Control systems. Integration with Fire Alarm Control systems. Power Lock providing Ram Resistance. Full Range of Locking Mechanisms. Full range of adjustable and tapered bearing hinges. Gate Automation Systems takes pride in training its staff to assist you in the decision making and advising of the correct swing gate requirements & design parameters for your site along with the safety devices required for your specific application, along with the professional installation of the systems purchased. 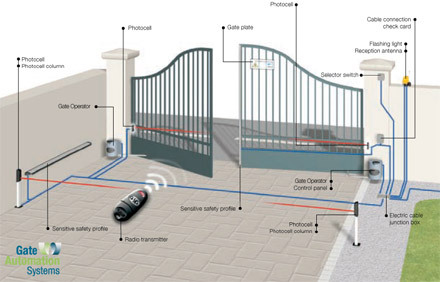 Click on the links below to find more about Sliding Gate Operators supplied by Gate Automation Systems.